Sonic the Hedgehog 3D Released! 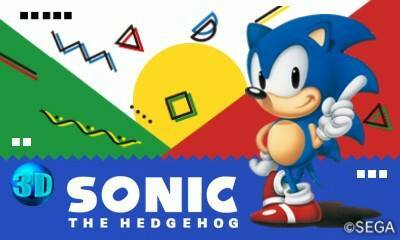 Sonic the Hedgehog has been released again, even though we lost count of how many times the game has been rereleased. However, there is a neat little addition to this version. The game is now released on the 3DS console, where the game actually has some 3D parts, including the backgrounds. For example, Sonic standing behind trees. It doesn't do anything but it is something new instead of just porting the exact same game. You also get the option to use the spin dash, but is definitely not neccesary. You can also play the international or Japanese version and adjust the screen to make it look like the old genesis days. I have to say, this is by far the best remake of the first ever Sonic the Hedgehog game we have seen so far. You can pick the game up at the Nintendo Eshop for $5.99/€4.99/£4.49 !! 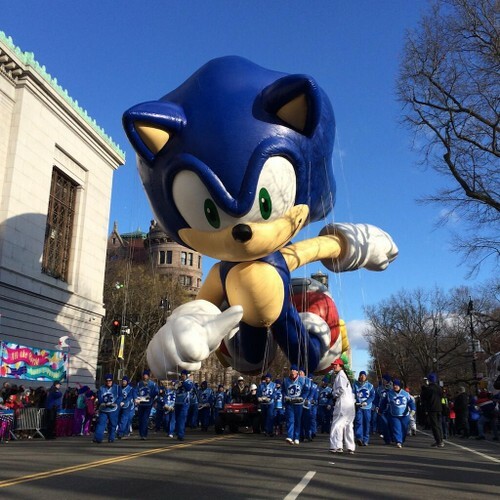 Sonic at Macy's Thanksgiving Parade! First of all, Happy thanksgiving guys! Several of us might have nothing to do with this event or never heard of it, but you can look it up Here. For some years now, the Macy's Thanksgiving Parade has gained a new addition. First participating in 1991 but due to some disaster not seen again until 2011, a Sonic the Hedgehog Balloon joins the parade! The blue blur, along with a lot of other balloons, goes throught several important and big streets with many people participating on the event. Following a small spoiler picture that has been released yesterday by Sega, it is now official. Sonic Dash has now made it's way to the the Android Systems. The spoiler itself didn't contain much, it was just Seaside Hill with an Android formed Sonic behind it. So it was expected that the game would be released sooner or later. Temporal Duality is the 45th album published by OverClocked ReMix and arranges music from Sonic CD , released in 1993 for the Sega CD. It features 38 tracks arranged by 39 artists that cover both the JP/EU and US soundtracks, originally composed by Masafumi Ogata, Naofumi Hataya, Spencer Nilsen, David Young, and Sterling Crew. Sonic CD was unique from other Sonic games of the era due to its time travel system that allowed players to experience 4 variations of each stage. The game featured different soundtracks for the JP/EU and the US releases, which were both ahead of its time for video games, being among the first to have Red Book CD Audio. Spanning 3 discs and numerous genres, Temporal Duality is the fourth OverClocked ReMix album to pay tribute to the 16-bit era of the Sonic The Hedgehog series! Among many others, OCRemix has also published remix albums for all previous games in the main Sonic series: Sonic the Hedgehog: The Sound of Speed , Sonic the Hedgehog 2: Hedgehog Heaven , and Sonic 3 & Knuckles: Project Chaos . Sonic Lost World got mixed opinions by both reviewers and fans, so it's natural that you're not completely sure if this game might be the one for you. Well, fear not, because the demo of both versions have been released on their respentative consoles, so everyone can check them out and give their own opinions, eventually leading into buying the game or staying away from it. To download the Demo, go the the respentative market (for example Nintendo 3ds shop) on your console, and you'll find the game under the tab Demo's. Have fun! SASRT has won 2 awards! Sonic and All-Stars Racing Transformed , the racing game with Sonic and the crew, have been granted two awards! The game has been nominated four times in the Annual TIGA games industry Awards. This game has been nominated for awards including Game of the Year. However, it wasn't able to get the achievement, but there were definitely two other awards, called the Arcade game of the Year and Outstanding Leadership awards. Congratulations SEGA and Sumo!! Another interesting point, is that people have been able to discover evidence of a new downloadable content. In the Steam Listing, there has been an ID found under the name of SteamDB Unknown App 264600, listed underneath the Metal Sonic and Outrun Stage DLC. It could be very likely that we will indeed get new DLC for the game. What it will be is yet to be comfirmed, and it is also unknown if it will be Steam exclusive or multiplatform, considering there have been several steam exclusive characters. However, those were released with patches, with the exception of Metal Sonic. So who knows what the DLC will bring us? Keep in touch and we will reveal it when we know it! M&S at the Sochi Olympic Winter Games 2014 out now! While many people might still have their hands on Sonic Lost World or are planning to get it, the next game has also been released for Europe. The Mario and Sonic at the Olympic Games spin-off franchise has been running since 2008 and today, the 2014 Sochi Olympic Winter games made it's debut. Alongside a nice Launch trailer by Nintendo, some new mechanics have been shown. Well, what are you waiting for? Mario and Sonic at the Sochi Olympic Winter Games 2014 is out now for the Wii U and 3DS! On another note, please remember that North America will get this game on the 15th of November, while Japan has to wait till the 5th of December. Yes, I'm not kidding. Zazz from the newly released game Sonic Lost World makes his return on that giant... Ball with a face thing to provide Sonic Dash players with a new challenge. The gameplay remains the same, except that you have Zazz to take on now while you're dashing and avoiding any hazards. Sonic Lost World out now! Sonic Lost World is out now for the Wii U and 3DS! Coming along with two beautiful trailers, the game has been officially released within Europe. Also, for people who didn't preorder the game or bought the digital copy, the Deadly Six Edition will be available for a short amount of time in the Nintendo eShop. Sonic Lost World will be released in Japan on the 24th of October, while North-America unfortunately has to wait until the 29th of October. Thought you survived a heart attack from all these updates yet? Well, I'm not done yet. Sega has recently released a picture of a comedical animated show called Sonic Boom , which will be released in Fall 2014 on Cartoon Network (uggh) in the United States and Canal J/GULLI in France. The show stares 4 characters from the Sonic universe, Tails, Knuckles, Amy and ofcourse the Blue Blur himself. The heroes will have comedical adventures where they fight the evil tyrant Dr. Ivo Eggman Robotnik in 52 episodes of eleven minutes. This show is mainly based to attract the younger audience, and that is where we end the fun. Yes, there are some negative complaints which some of us will like and some of us will hate. The show is ment for kids from 6 to 11 years. Not the biggest complaint I guess, since people don't have problems with My Little Pony either.... Okay, I said nothing here! What's up with the Shadows of the characters? No seriously, just look at it, then look back here, look back at the shadows and then post your opinion down below. It will be most likely that those 4 characters, excluding Eggman and the enemies, will be the only characters included within the Show. Well, that's all for today folks! Keep in touch for more updates later on!